The DSR115 Active Loudspeaker features an ideal combination of advanced digital sound processing and the latest acoustic technologies for Integral Digital Tuning, plus Yamaha's D-CONTOUR (Dynamic-CONTOUR) multiband dynamic processing for Intelligent Dynamic Control. The DSR115 is loaded with 2 Class-D amplifiers with a PFC (Power Factor Correction) switching mode power supply. 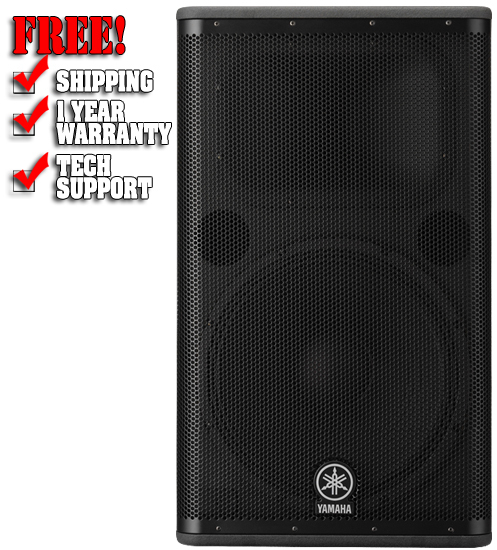 One amplifier deliver 850 watts to a premium grade 12" neodymium woofer with 3" voice coil and a second amplifier supplies 450 watts to a large 2" high purity titanium diaphragm, neodymium, high-frequency compression driver. A LTBD (Long Throw, Broad Dispersion) Constant Directivity Waveguide Horn spreads the sound across 90° x 60°. The DSR115 has an impressive maximum SPL of 134dB peak. The digital crossover networks use high-order FIR (Finite Impulse Response) filters providing linear phase response. Yamaha's proprietary FIR-X tuning technology simultaneously optimizes frequency and phase response, whilst adjusting the time alignment between the HF and LF transducers. The end result is substantially higher sound quality than can be achieved with conventional analog crossovers. All signals are precisely processed by a 48-bit internal processing, (76-bit accumulator), high performance processor for optimum sound quality. The DSR Series speakers employ high-precision discrete ADCs and DACs with superior S/N ratio and dynamic range. The analog signal is transmitted on dual channels, converted to digital and summed inside the processor. By using this algorithm, an approximately 3dB improvement in S/N ratio was realized. FIR-X tuning provides for the smoothest possible crossover transitions. Yamaha's next-generation Class-D amplifiers deliver as much as 1300W of power with precision damping for tight and crisp sound from compact, lightweight modules. Through the ideal combination of amplifiers, transducers, and DSP, the DSR Series loudspeakers provide the highest levels of power in their class, while maintaining precise dynamics and sound reproduction. Efficiency is such that convection cooling is all that is necessary, eliminating the need for fans. The DSR Series employs a Yamaha-developed high-efficiency switching mode power supply with PFC. The full resonance switching method uses both voltage resonance and current resonance, creating a clean power supply waveform with minimal high frequency noise. PFC harmonizes the phases of the load current and power supply voltage, maximizing power output and ensuring stable operation under severe conditions. This clean, efficient power supply enables the entire speaker system to achieve its full performance potential. To ensure the highest possible reliability, the DSR Series employs many of the same protection functions used in Yamaha's top-class TXn Series professional power amplifiers. These functions protect all aspects of the power supply, power amplifier modules and transducers so that they can operate to their full potential while ensuring fail-safe operation even under the most severe conditions. 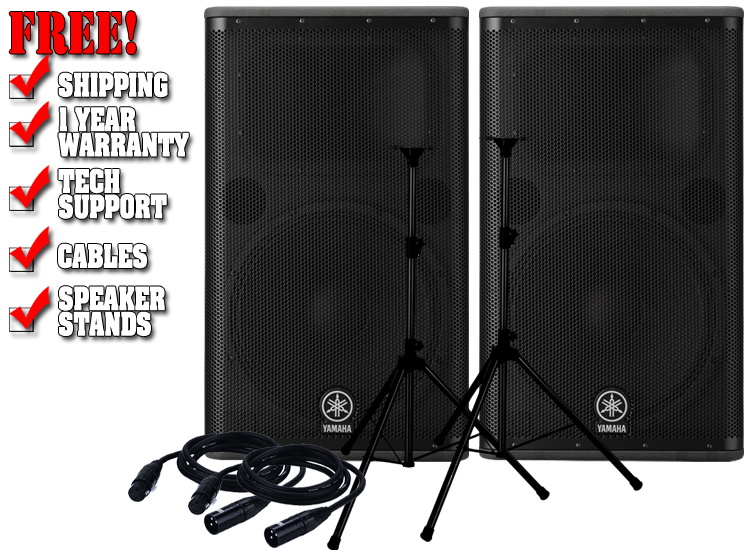 The DSR115 performs as main PA and is stand and pole mountable, with a 35mm pole socket. M10 rigging points allow for suspended installation.